Is an innovation of the current forms of Government possible? A. THE CURRENT MARKET & SOCIETY SYSTEM THAT DOES NOT WORK BY ITSELF (it has a “factory defect”). The System should be a Democracy, in which the Customers “reward” a product with their choice (weakening the other products); and they, as citizens, “reward” electoral candidates by choosing those who can best develop solutions for their needs (who can use their money better). The fact is that today we live in a dimension of Crony capitalism, the cheat that kind of system (it is no longer at the service of people, so people cease to make their fundamental contribution to the functioning of a democratic system). The real problem of this is that this mode irrevocably puts in crisis not only people (Citizens/Customer are impoverished because they are induced to continuously buy products that cease to work after a short time, and have to pay increasingly expensive taxes; they are also not satisfied in their needs). But it also puts the “System” (Market & Society) in crisis because the phases of recession occur, and the Market Players are no longer able to sell. And the Politics Players lose their electoral consent. B. THERE IS NO MORE CERTAINTY OF THE RULES: either because the Governors continually produce “crony-Laws” that favor the incumbens (thus preventing the development of real innovation). And the courts end up producing arbitrary sentences (according to ideological interests, or other). 2) THE SYSTEM CAN NOT BE MODIFIED FROM THE INSIDE. As for the market big players are not able to reform themselves <see The great Firms are not able to develop disruptive innovation within them>, the current Government is not able to reform itself. The current Society & Market System is “armored”: it can not be changed because (a) Market and Business integration prevents any attempt at real change (b) lack of awareness on the part of people both of what is happening and of the possibilities for change. for their impoverishment, and for the lack of satisfaction of their most important needs (it is not adopted here the point of view of Marxism, but we simply speaks of Disruptive innovation). 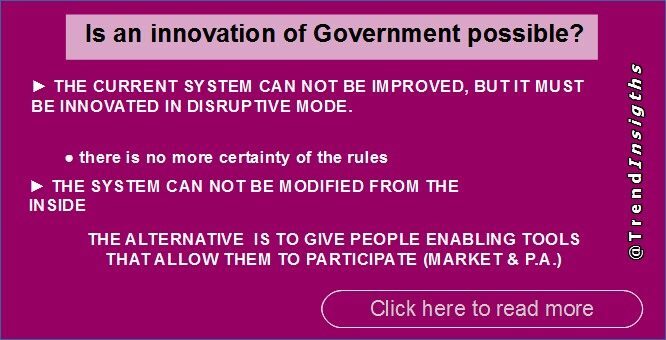 It should be noted that this disruptive innovation of the Market and the Public Administration System goes towards decentralization. That is in the direction of a “Localization” of the Market and Government.